The S&P500 inched higher Thursday, but for all practical purposes this was another flat session. We smashed through 2,540 earlier this month, but have been struggling to add to those gains ever since. Volatility has been picking up over the last several days, producing the largest intraday swings since Trump’s war of words with North Korea. Most of these gyrations have reversed within hours, but the transition from calm, one-way moves higher is a material change in behavior. Previously the Bulls were firmly in control and Bears were helpless to stop them. But this uptick in volatility tells us Bulls are losing their grip and Bears are growing stronger. Volatility often increases just before a reversal in direction. We saw that during the North Korean lows and could be witnessing the same thing now as the latest rally runs out of steam. Markets go up and markets go down, that’s what they do. There is nothing wrong with a healthy and normal pullback to support there. After Thursday’s close, GOOGL, AMZN, and MSFT put up strong results. Without a doubt parts of the tech sector are doing very well. But this strength doesn’t seem to be carrying over to the broad market as overnight futures are only up a tenth of a percent. If tech earnings were poised to launch us higher, we would see a larger reaction in the futures. But this isn’t a surprise. There is only one thing that matters to this market and that is Tax Reform. The House passed the Senate’s budget. Last Friday the market surged to record highs when the Senate passed their budget, but today market was much cooler to the House doing the same thing. That’s because 20 Republicans voted against the budget in protest over cuts to state income tax deductions. Everyone loves tax cuts and the market has been rallying on that positive sentiment. But now we are transitioning to the debate over what taxes will be raised in order to pay for all those lovely tax cuts. Interest expense, 401k, and state income tax deductions all find themselves on the chopping block. On Thursday twenty Representatives demonstrated their displeasure with the proposed changes. Trump already said he was opposed to cutting 401ks. And let’s not forget our president is a real estate mogul. Anyone think he will sign a bill that eliminates interest deductions for his business and real estate loans? Yeah, me neither. November 1st is when we are supposed to see this widely anticipated bill for the first time. If the healthcare debate is anything to go by, there is a good chance this bill will be delayed coming out of committee. Once it finally sees the light of day, it will get shredded by special interests. If there was one thing Republicans could agree on, it was their disdain for Obamacare. Yet even with that unity driving them, they still couldn’t repeal it. What is going to happen populist moderates, fiscal conservatives, and pro-business Republicans duke it out? It won’t be pretty and it won’t be fast. Expect the hope of Tax Reform to give way to despair over political infighting. There is a good chance Republicans will pass something…..eventually. But it definitely won’t be as grand as many are hoping for. In the meantime, expect the stock market to give back a chunk of recent gains as it consolidates and allows the 50dma to catch up. This is definitely a better place to be taking profits than adding new money. 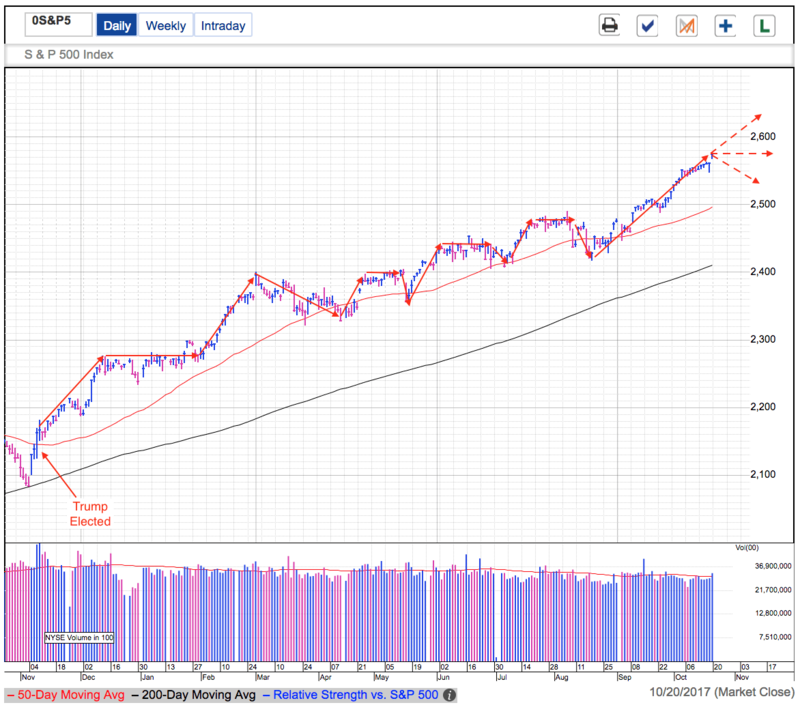 On Tuesday the S&P500 tried to recover Monday’s selloff, unfortunately the follow through never materialized and we finished well off the intraday highs. Traders still seemed more inclined to take profits than buy the dip. If this market was poised to rip higher, this was the bulls’ opportunity. The lackluster buying suggests this weakness will likely extend past Monday’s dip. But this isn’t a bad thing. 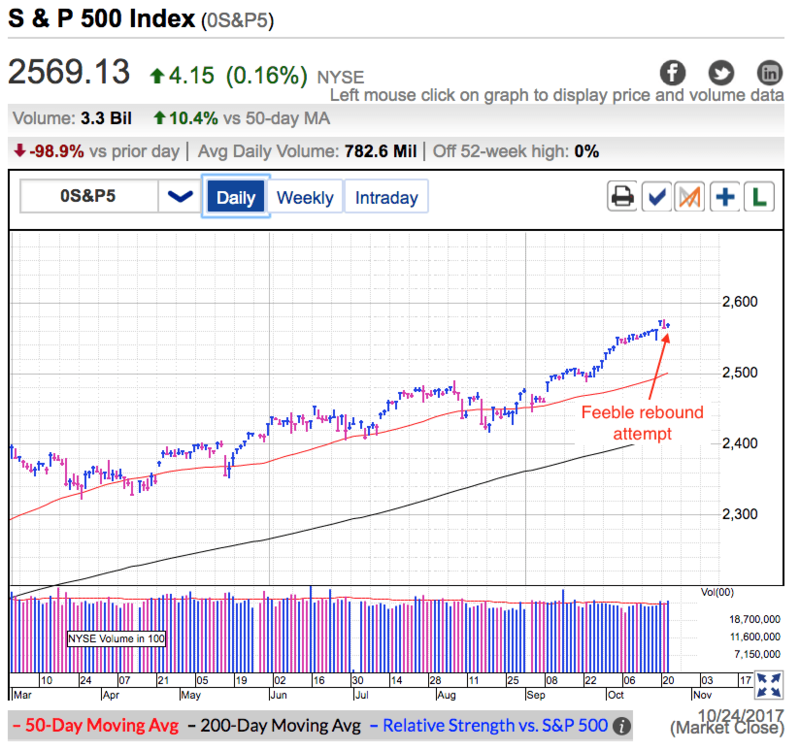 The recent runup leaves us 70-points above the 50dma and a check back is long overdue. The only question is if we dip back down to this key moving average, or trade sideways and allow it to catch up. Falls from unsustainable levels typically happen quickly, so the longer we hold current levels, the more likely a sideways consolidation becomes. But we need a few more days because two-days definitely doesn’t qualify as solid support. Last Friday we broke out to record highs when the Senate finally agreed on a budget. That clears the way for more significant Tax Reform. Unfortunately those fuzzy feelings didn’t last long and rifts within the Republican party started showing as Trump and key Senators started throwing barbs at each other. Trump definitely has a more antagonistic leadership style and that will likely lead to more tension during the Tax Reform debate. The market hates uncertainty and this conflict will likely erase a big chunk of the hope that lifted us to these levels. I’m most definitely not a bear and still think the path of least resistance over the medium-term is higher. But I have also been doing this long enough to know the market doesn’t move in straight lines. After a period of nice gains, it is perfectly normal for the market to consolidate the runup. This is part of the healthy process of moving higher. In fact I would be more concerned about the sustainability of this rally if we didn’t consolidate recent gains. The higher we go, the harder we fall when the inevitable consolidation eventually happens. All of this means this is definitely a better place to be taking profits than initiating new positions. But just like how we shouldn’t overreact to recent strength, the same level-headed thinking will be required if we dip further over the next several days. Additional weakness is creating a buying opportunity, not an excuse to reactively abandon an otherwise healthy market. Remember, smart money trades proactively by selling strength and buying weakness. Reactive traders bleed themselves dry by doing the opposite they buy high and sell low. Don’t be a reactive trader. This post includes a summary of the week’s market developments, links to the free posts I published, and analysis on how accurate each post was since I wrote it. The attached chart shows the market’s waves over the last 12-months. Five periods of up followed by sideways and/or down. 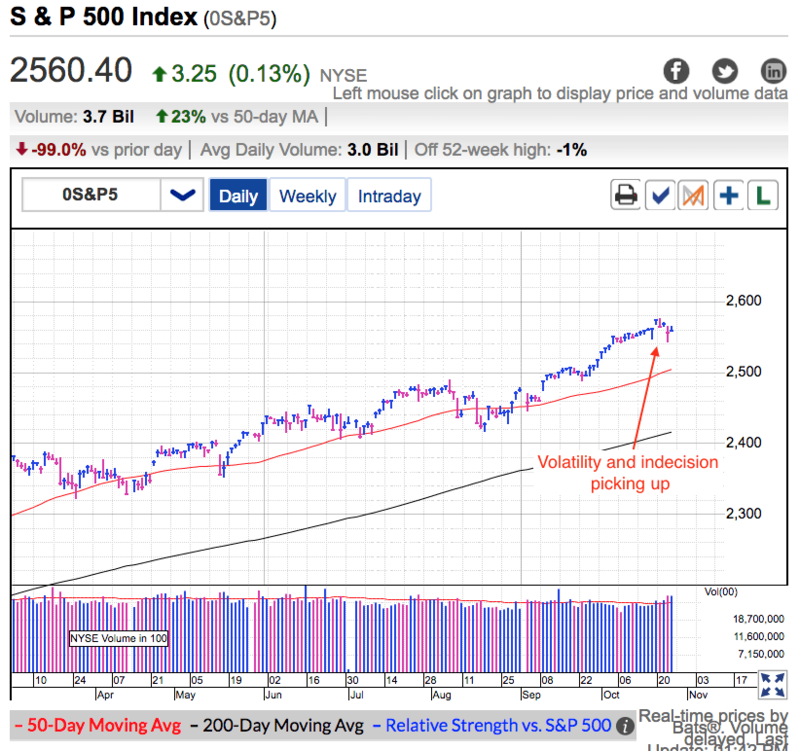 When prices dipped to the 50dma, the consolidation tended to be brief. The times we didn’t dip, the market traded sideways until the moving average caught up before staging the next leg higher. Currently we are approximately 80-points above the 50dma. Early in the rally we found ourselves as high as 100-points above the 50dma before peaking. Other times we stalled 40-points above the 50dma. 80-points is definitely on the higher end of the range, but not the most extreme and it is possible we could go a little higher. But it would break precedent if we went a lot higher. And to be clear, I’m not bearish nor am I predicting a crash. The 50dma is a little too far away and we either need to pause and let it catch up, or we dip back down to it. Nothing more, nothing less. If anyone believes our leaders will have constructive dialogues, quickly arrive at consensus, and pass a great Tax Reform Bill clearly isn’t paying attention. Politics is messy and I have no doubt Tax Reform will stumble countless times before it has a chance of passing. A) Throw a fit until you get what you want. B) If you don’t get what you want, blow everything up. That is how Healthcare Reform went down and if anyone thinks Tax Reform will be any different, there is a medical term for that, it’s called insanity. There are several opposing forces in the Republican party that will make any compromise difficult. First are the pro-business Republicans who want aggressive business tax cuts to stimulate growth. Second are the fiscal conservatives who bristle at the thought of adding to the deficit. And third are the moderates who want to see most of the tax cuts benefit the middle class. Three very different factions whose ideas are in direct conflict with each other. Without a doubt we will see someone throw a fit and refuse to support the first draft of the bill. Get three of those someones and the whole thing goes down in flames. There is a good chance a compromise will eventually be reached, but politics is ugly and most likely this process will teeter on the verge of collapse moments before it is salvaged at the last possible second. Expect a lot of bad news between now and then. Score To Be Determined: We won’t know how accurate this analysis is for several weeks, but I haven’t seen Congress pass meaningful legislation without relentless bickering and infighting. And that is a normal Congress. This group of Republicans is even more fractured and divided than normal. I would be shocked if Tax Reform progresses smoothly and we should be prepared for the volatility this heated debate will trigger. For those of us that are paying attention, this looks a lot like a lethargic wedge higher and suggests this market is running out of gas, not on the verge of exploding higher. Explosive moves are by definition explosive. A tiny trigger blossoms into in a much larger move. Sometimes it is an unexpected headline, other times a technical breakout. But something triggers a surge of buying and away we go. Unfortunately this wedge higher is the opposite of explosive. We keep getting good news. Today the Trump administration said they wouldn’t put conditions on repatriated profits and companies could use their newly liberated cash for dividends and buybacks. More cash in shareholders’ pockets is always a good thing. Then there was the technical the breakout as we moved into record territory. The cumulative result of both of these bullish developments, a measly 0.07% gain. Something so small it doesn’t even qualify as a rounding error. Every day bulls are trying to push us higher, but the gains are getting smaller and smaller. That reeks of exhaustion, not unbridled potential. Without a doubt it is encouraging we managed to hold recent gains. Typically markets tumble from unsustainable levels quickly. This strength comes from owners who are confidently holding for higher prices and few are taking profits. Their conviction keeps supply tight and props up prices. Unfortunately propping appears to be the best bulls can manage. We need new buyers to keep this rally going and right now those with cash are reluctant to chase prices any higher. Score 7/10: The market popped 0.5% Friday following the Senate passing a budget. By itself this event doesn’t mean a lot, but it brings us one step closer to Tax Reform. I still believe this will be a bumpy road, but any progress is good. The market is up 15-points from when I wrote this post so I docked myself a few points, but I still think the analysis is valid. The true test will come next week when we either extend Friday’s gains, or that breakout fizzles and we slip back to 2,550. Most likely prices fizzle, but there is a chance a frenzy of buying sends us dramatically higher. But the higher we go without consolidating gains, the harder we fall when it finally happens. Excerpts from my educational series. Click the title to read the full post. Signup for Free Email Alerts to be notified when news posts are published. Knowing what the market is going to do is the easy part. Getting the timing right is where all the money is made. Have insightful analysis like this delivered to your inbox every day during market hours while there is still time to act on it. Sign up for a free two-week trial.